I made these little babies last night with Aaron. He helped me make the lotus paste filling. Yes, we made the filling from scratch, stirred non stop. We took turns but still, it's very tiring... Partly because I really wanna make something for this year's mooncake festival. Partly because I love the texture of Ping Pi mooncakes and I still haven't try and no urge to try making baked mooncakes yet. I might or might not, depending on my tight schedule. Anyway, I really like this recipe. It is steamed and uses glutinous rice flour rather than koh fun (cooked glutinous rice flour). However, I had so much blunder in making this. First, I think I oversteam it. It's a fine line between able to knead and rock hard. Also, I did not grease my steaming tray because Angie's recipe didn't say so. When I remove it from the steamer, I think I cooled it too long before kneading in the shortening. The dough was such a nuisance and oversteamed that the shortening just wouldn't mix in. I ended chopping the steamed disc into smaller parts, pop that in my food processor along with the shortening and pulse until it all became fine breadcrumbs. Yes, it still didn't form a cohesive dough. At the verge of giving up and throw the whole dough away, I angrily knead the dough with my fingers in anger. To my surprise, it starts binding together. I further knead it like how I would knead my bread dough and it ended up turning smooth and workable. Still a little tough and cold as if it's just out of the fridge but I knead it to keep it at room temperature. It's really cold in Adelaide now so more effort. Here comes the worst nightmare, I weigh and weigh and weigh until I really don't wanna see a weighing scale temporarily. I knead in a little vanilla paste into the plain dough. Can't really see the speckles though. I knead in a little red colouring and rosewater essence into the other quarter. Finally, I kneaded in 2 tsp of cocoa powder and 1/2 tsp of pandan paste into the remaining dough. Kneading it was super tough. My perseverance and diligence finally pay and I then weigh each colour of dough into 14 parts. Grab 4 different colours each to form one and roll that out, dusting sparingly with cooked glutinous rice flour. Plunge it out with my super awesome disney character mooncake and repeat that another 14 times. Pop it in the fridge to chill for an hour or so and ate Doraemon after that. Had a few more with Aaron and give away the rest to friends who are really impressed now. I like working with this dough better because it doesn't shrink back as much as the normal ping pei mooncake recipe does but I still like the texture of the normal ping pei mooncakes though. This is nice but it somehow ended on the more chewy side. I think I must have over knead it. It's soft but a little chewy. However, taste wise, I like this though. I'm a Dairy Girl and the taste of this was so milky due to the condensed milk and evaporated milk used. Bakingmum's one ended up rock hard the following day. Mine didn't though. I kept one until the third day and it remain soft but slightly chewy. I really think it's the weather. If I were you and want to make this, I really wouldn't substitute anything and follow it exactly. Don't oversteam the dough if you wanna make half the recipe like me. As for filling, I adapted the lotus paste recipe from Yum Yum Magazine. Here you go just in case you wanna try. I substituted maltose with honey. I have also tried substituting with maple syrup. I like both honey and maple syrup too. I can taste them in the filling along with the taste of not overly sweet lotus filling. If you want the filling recipe, email me okay? I am so tired now I really don't feel like typing it. And nope, no cross section picture, it was gone as fast as a thunder! Recipe is from Angie's, click here! So, did I improve tremendously from my last attempt a year back? You be the judge! 8 comments on "Marbled Ping Pi Mooncakes"
Hi Quinn, thanks for the link-back. If you find them slightly chewy, then use slightly less starch, and more glutinous rice powder. That helps. However, I would not leave too much of starch away, or the dough would go too soft. The colour matches well. I think you really spent a lot of time cooking the paste---really hard work. Thanks for dropping by. You have great patience, if I am in your shoes, I might have already given up on this snow skin mooncake. LOLz. Nevetheless, i am glad yoru effort pays off. Angie: Thanks for the tips. Will keep that in mind until next year! Edith: No worries about me dropping by. I was at the verge of throwing it and was fidgeting with it like playdough but hey, it turns out smooth and combined! Beginner's luck, no? My email is : bakingquinn@gmail.com If you see the welcome column on teh right hand side of my blog, it's there. Cheers and thank you people! Thanks Elin, I bet you could do better than me, anytime! I have the same disney plunger moulds as you do, and am just wondering what is your preferred ratio for snowskin pastry to filling to use in the mould? Thanks. Serena, I don't have an exact ratio, I always follow a recipe. 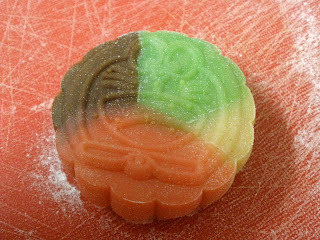 But if making mooncakes with this exact mould size, I always use 63-75g filling, depending on how good I am in wrapping the skin. I'd say the skin is approx 19g so I'd say it's a ratio of 1 part skin to 3 parts filling.